Why are Voters Turning Against Eric Cantor? In Short – Eric Cantor is a Bob McDonnell Republican! | Virginia Right! Why are Voters Turning Against Eric Cantor? In Short – Eric Cantor is a Bob McDonnell Republican! A friend of mine stopped by yesterday. We used to go to the same church together and she is a good, solid Conservative. Not one that is consumed with politics, mind you. Unlike many of my friends (outside of my musician friends – my only respite from the political world) Donna votes, pays attention and longs for a world that will be a suitable place for her two boys to grow up. Well, they are mostly grown now, but at least a world where they can be free to be the people she hopes they will be. Now Donna is not what I would consider a low information voter. I would put her somewhere above that. She sees voting as both a privilege and a responsibility. But she does pay attention to the issues and plans to vote in the primary on June 10th. I would classify her as a “responsible” voter. Both Donna and my sister have accompanied me to several political events. They do love a good party. And most people know I have worked hard as a volunteer for Eric Cantor for years and he has always had my vote. And the last time I spoke with Donna I was doing my best to keep our Congressman in his seat. But something happened to shake my confidence in the Republican Party and prompt me to question my years of service and blind allegiance to both Eric Cantor and the Republican Party. Well, it was actually a combination of things. But the most profound was the tax hike that Bob McDonnell and the Republican Party – the “fiscally conservative Republican Party” rammed down our collective throats. Besides McDonnell, 43 Republicans betrayed us and voted for the largest tax hike in Virginia history. And I had endorsed and worked for McDonnell and many of the 43 Republicans that suddenly lurched to the left. And the vote came at a time when Bob McDonnell was winning the battle of Conservative philosophy vs. Liberalism. Surplus after surplus. VDOT lost cash recovered. If Bob McDonnell had run on the Transportation Tax Hike or even hinted that this was on the horizon, he would have not received my support or my vote. And when I raised up my head to look around, I found some local Republican politicians – here in Hanover County – that I had also endorsed and helped to elect were not quite the Conservative they led us to believe. They began pushing ill conceived plans to draw low income housing to Hanover and the connections to the developers that stood to make money from this was clear. And reflecting back on post Clinton era when the Conservative ideology made a comeback, what exactly happened? We gave George W. Bush the White House, House and Senate and he spent money like a Liberal and managed to get us involved in two wars. And while I believe the wars themselves were the right thing to do, the lessons from Vietnam had obviously been forgotten. War can be a bottomless pit for money and lives when the mission becomes nation building. George W. let us down. Here at home, McDonnell let us down. And even closer, some of my county supervisors let us down. And where does Eric Cantor fit into this? 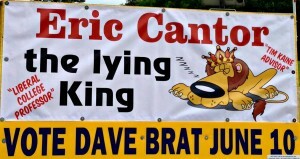 Well, for most voters who are paying attention, Cantor has been a big part of the problem. He pretends to be conservative, but his record says he is not. And I think that the lessons Bob McDonnell taught the “responsible” voter as well as the seasoned politico was that Republicans can be full of crap. And we can no longer take career politicians at their word. We don’t need to. They have a voting record. And voters are seeing Eric Cantor as a Bob McDonnell Republican. All McDonnell got was a tax hike and money and a Rolex from Jonnie Williams. Cantor has made millions and even went so far as to exempt his wife from the insider trading laws that the rest of us have to obey. And while Eric Cantor has had every opportunity to put his reputation where his mouth is – to repeal Obamacare and stop the out of control spending – he has failed. Not only that, he reversed Sequestration. And while Sequestration – a law that was supposed to save us money by rolling back spending – was mostly smoke, mirrors and empty promises, Cantor voted to get rid of even that. And the last time they “shut down government” Cantor caved and didn’t even get a penny in concessions from the Obama Administration. 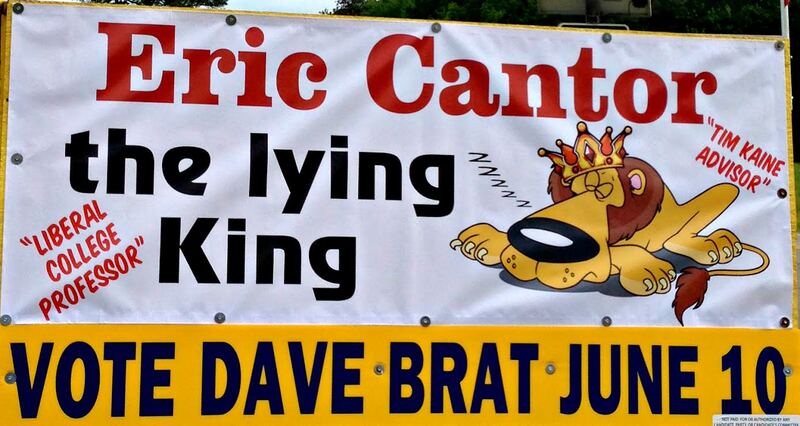 People are realizing that Eric Cantor is playing a game. And they are tired of it. Turning back to Donna, how was I going to tell her that I misled her all these years and I no longer support Eric Cantor? “So who are we going to vote for in this primary? I can’t vote for Eric Cantor again. I just can’t,” she said out of the blue. So it seems that Donna had come to the same conclusion about Eric Cantor that I had. All on her own. 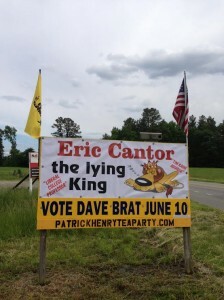 Neither of the Cantor signs will vote in the primary. And I have placed Cantor signs in both of these neighbors yards multiple times. When I speak to these guys and tell them that Cantor is lying about Dave Brat and that Dave is a Conservative, but Cantor will flood the job market with Amnesty so that their kids will not be able to find jobs and Cantor exempted his wife from insider trading laws and has made millions in this poor economy you want to bet that they take down these signs? Smart money says the signs are gone this week. But I am OK with the Taxation is Theft sign. I may put one in my yard. But you know what sign I want to put in my yard? And it seems that there are a lot of other people that are getting the message that Eric Cantor is no longer working for us. Check out these links to see what others are thinking. And the Virginia Free Citizen. 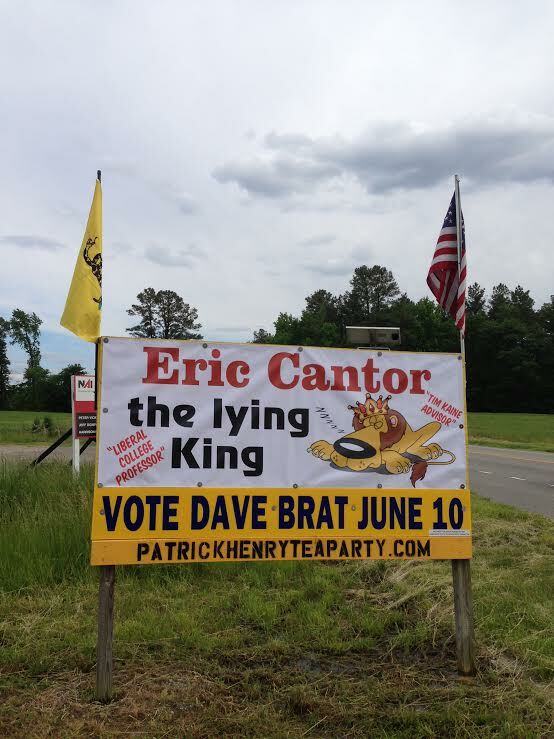 Ok, so it is very clear that Cantor now votes like a Democrat, is stealing from our children/grandchildren, and has revealed himself as a bald faced liar! Please pray that the truth gets out to enough primary voters between now and June 10th.